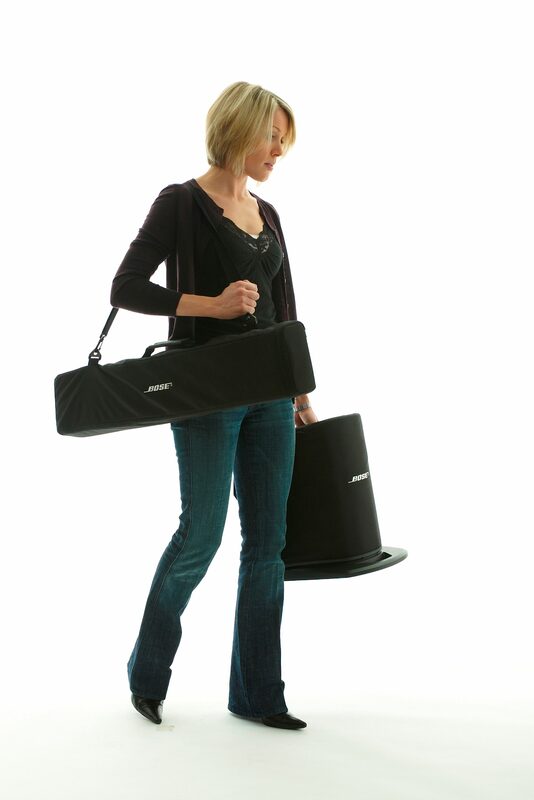 The Most Portable, Most Affordable Bose L1 Sound System! With the L1 Compact Portable Line Array System, Bose appears to have completely redefined the meaning of the word "portable." You've probably heard this word applied to other PA systems before, only to find your back and knees protesting to the contrary. But at just 29 pounds, the Bose L1 Compact system truly reclaims the word. 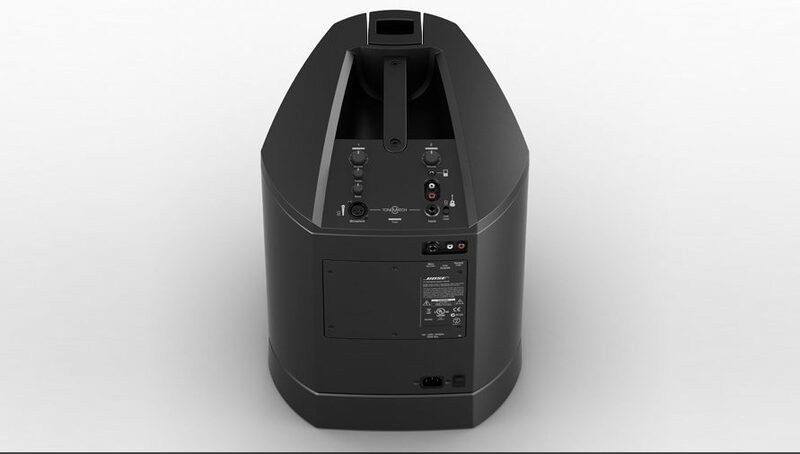 This is really an amazing step forward for compact PA design, and it will easily fill a room with sound for up to 100 listeners. The Bose L1 Compact is the smallest, lightest, and most affordable system in Bose's series of L1 portable line array systems -- and it's the most popular, too. The Bose engineers have totally rethought the entire concept of live sound to bring this the L1 Compact system into existence. By eliminating the need for separate front-of-house speakers and the performer's monitors, they've also managed to solve the age-old discrepancy between what people are hearing on different sides of the array. Intimate venues and spaces used to be a challenge for anyone carrying separate speakers and monitors. Now small spaces can actually be an advantage! Bose achieved this miraculous design with their Spatial Dispersion technology. Six independent mid/high-frequency drivers are precisely balanced and mounted within the L1 Compact's slender profile. This allows the L1 Compact to deliver nearly 180 degrees of coverage. Dynamic levels remain consistent, even when you're standing flush with the system itself. This is why you'll hear as clearly on stage as the person in the first row of the audience. The Bose L1 Compact can either be used in a Collapsed mode or in an Extended setup. In Collapsed mode, the mids and highs play from below, just above the integrated bass driver in the L1 Compact's base. When you want to fill more space and achieve greater frequency distribution, simply insert the extension unit to raise the mid-to-high drivers at a natural, standing ear level. The L1 Compact features an onboard mixing console with two channels, bridged by Bose's ToneMatch technology. 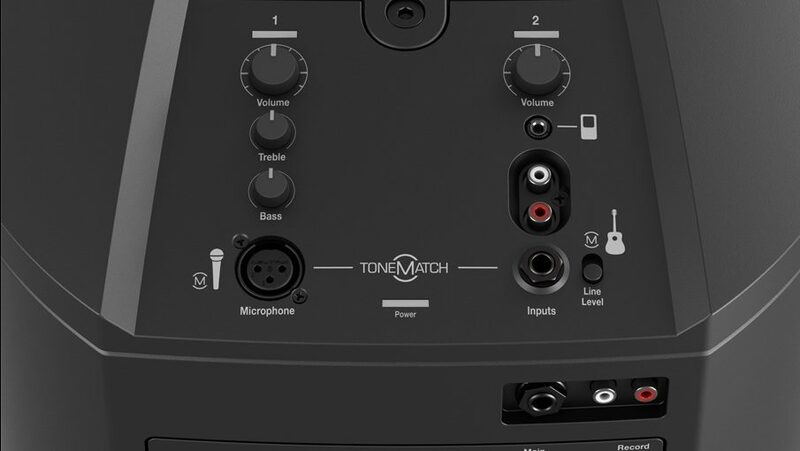 The ToneMatch system allows you to adjust EQ and tonal settings quickly and easily. A single balanced XLR input on Channel 1 is ready for you to drop in a vocal microphone, while the Channel 2 is pre-optimized for any 1/4-inch, 1/8-inch, or RCA input. Your guitar and your iPod will sound equally clear piped through the 1/4" and 1/8" jacks, respectively, while your turntable rig takes advantage of those RCA inputs. 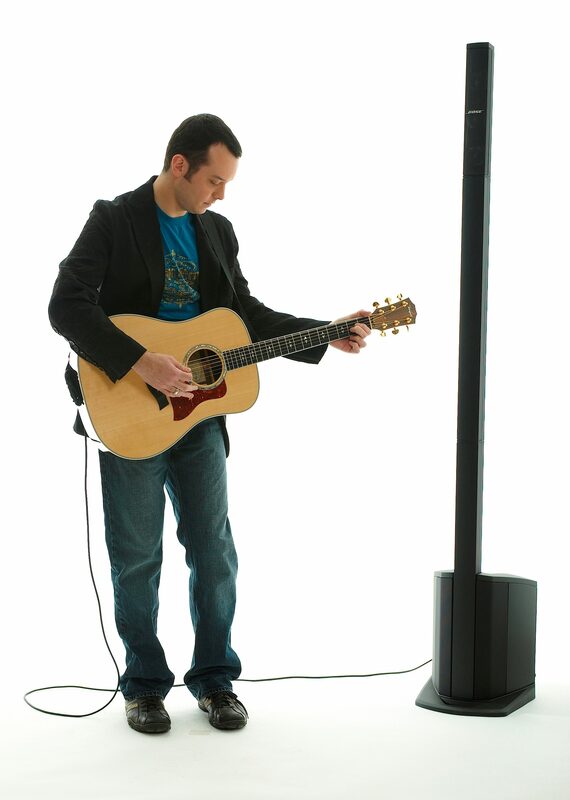 And did we mention how great this system is for a singer/songwriter with one guitar and one vocal mic? The entire L1 Compact system breaks down into three pieces -- one base, one extension, and one speaker array -- and fits neatly inside the two included carrying bags. All told, the L1 is a brilliantly designed and great-sounding small scale PA system. It will be ideal for your musical performances, your DJ gigs, or for use in a classrooms, lecture hall, or business presentation. 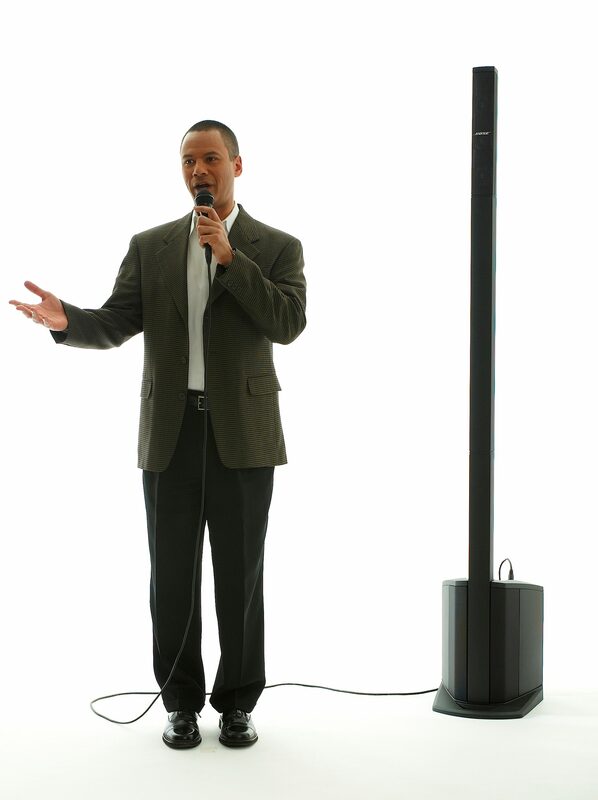 The L1 Compact system combines conventional PA and monitors into one sleek unit. Positioned behind or to the side of a performer, DJ or presenter, it delivers wide, even sound coverage throughout the stage area and audience--even off to the extreme sides. It's our smallest, lightest, easiest-to-set-up L1 system, weighing just 29 pounds. Overall: I have to admit, when it showed up and I saw how small it was I didn't think it would be loud enough. I play in an acoustic duo and my gig last night was at a bar that is legendary for being loud. For some reason, the way the bar is set up, the patron' s talking volume gets very loud. Smaller PA systems I've tried to use struggle to combat the volume of the people there "yell talking" to each other haha. I've used bulky behringer 15" eurolive speakers and they work well there. I was tired of lugging around heavy speakers and stands. Trying to find a power source to plug both in etc...This bose l1 compact BLEW ME AWAY! I couldn't believe how well it filled the room with volume. We cranked it to an unbearable volume to just see if it would clip. We never got to the red clipping light. Had to back it off. We played in a noisy bar with around 40 to 50 people and the sound was great. It was crisp and clear no matter where you were sitting. It's almost as if the sound surrounds you. Unbelievable what this thing can accomplish for being so small. I needed 3 channels so I ran the right side output of my mixer to the right side line level 1/4 inch input of the L1. I panned all channels to the right. Ran the mixer main at noon and the L1 at around 11 o clock. It was perfect. At one point we ran mixer main to 3 o clock and L1 to 3 o clock. Not even a little blip of red on the "clip o meter". Hands down best desision to buy this. Love it. Overall: The Bose L1 Compact was purchased as a backup to my Bose L1 Model 1's I use for professional Dj use. It is lightweight and blends in with the decor. It has ample power to keep up with it's big brother and is an awesome addition to my already amazing setup! Extremely portable and can be run off a A/C powerpack for remote sound. I have been a professional mobile Dj for 20+ years and this is the most clear and lightweight speaker in it's class! I really like it! !